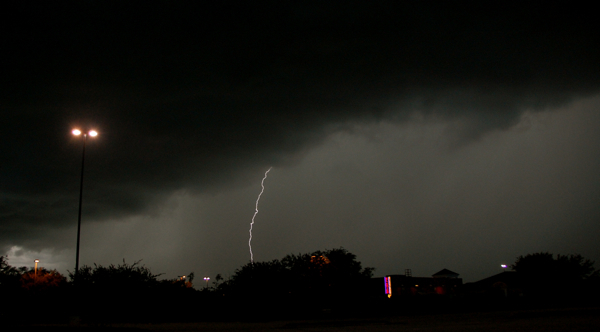 This successful daytime lightning photo was taken in the parking lot of J.C. Penney in the Melbourne Square mall. I've always wondered how difficult it is to get a photo of lightning during the daylight hours. I have plenty of night shots, taken with a lengthy shutter speed in order to catch whatever bolts strike within the frame. But during the day, a lengthy shutter speed would overexpose the photo. So how do those photogs do it? I'm too much of a male to consult a manual or guide book, so I set out to devise my own approach. And the only solution, I thought, was to use the rapid-fire technique, depressing the camera trigger, snapping shot after shot until lightning struck within the frame. I tried that during a thunderstorm last night over a parking lot at the Melbourne Square mall. It was before sunset, so it was still quite bright, but storm clouds had darkened the sky a bit. I pointed my camera toward an area that seemed to be getting the most strikes. And I snapped at will. I can get only about 2 1/2 frames per second on my Nikon D40. But on the 65th shot, lightning struck. And I caught it. So it's really not that difficult.